A smooth ferry crossing to France, we disembarked in Calais and had an easy, one and a half hour drive on straight and not too busy roads to Brussels. Our trusty sat-nav took us right to the centre of the city and our hotel without incident or hassle. Bags were speedily thrust into the hotel room and we set out to explore. Having driven off from our Dover hotel after breakfast it was great to be ready to start our Brussels sightseeing the same afternoon. I love this city – one of my favourites and once the seat of emperors it has a charming old world feel and a compact city centre that is so easy to explore. We started in the focal point of the city – the Grand Place. This huge square with its 17th century guildhouses bustles with people and is all space and sparkling grandeur. Arriving in the Grand Place always gets to me, this time was no different. Son was devouring his first (of many) oozing chocolate waffles and we were ambling around the narrow cobbled streets that surround the square, admiring shop windows and the architecture. We stepped, almost inadvertently, into the Grand Place and our perspective suddenly zoomed wide. From narrow and quaint, you are hit with a vast space full of gilded facades, gold sculptures on rooftops and breath-taking beauty. We didn’t know what to look at first – the gabled guildhouses, the Town Hall, the King’s House – everything is simply stunning. Son loved the Town Hall with its Gothic facade and spires. This is apparently the only building to escape bombardment by the French in 1695 – a bit ironic when it was their main target. More than five thousand wooden buildings were destroyed but everything was faithfully rebuilt by the merchants guilds and became the headquarters of these traders who controlled politics and commerce in medieval times. All very ornate, all adorned with statues and all very impressive. Number 9 was the headquarters of the Butchers’ Guild but apparently Karl Marx lived here when he wrote the Communist Manifesto. Number 26 also had a famous inhabitant – it was once home to Victor Hugo. The Town Hall was built in 1482, Son and I stood well back to look at the spire and the magnificent details. Full of figures, each one is different, we challenged each other to choose our favourite. The tower is slightly off centre, I read that legend has it the architect discovered his mistake and jumped from the tower to his death. We strolled around the cobbled square in the daytime when the sun sparkled on the golden buildings and it was gorgeous. 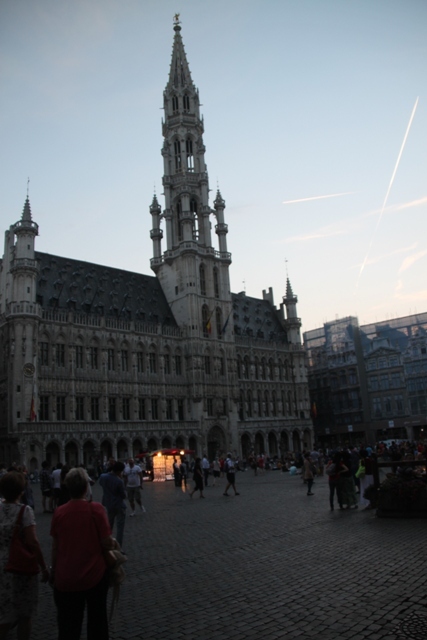 However my favourite time in the Grand Place was late in the evening when it was dark. The whole place was lovely, all lit up and very atmospheric plus the crowds and crowds of tourists had dispersed. One regret about this lovely square – we had come just a bit too early – two weeks to be precise. Every two years in the third week of August they decorate the square with a carpet of flowers. Colourful and magnificent but we only got to see pictures and postcards of this spectacle. Maybe next time. It was not just me who left loving Brussels, Husband and Son easily came round to my way of thinking. I’m sure we’ll be back. 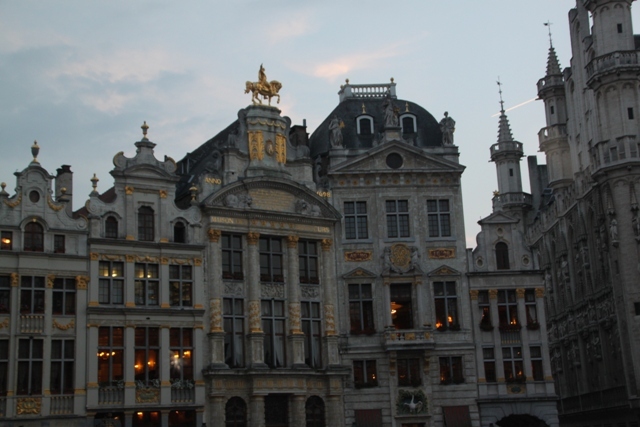 I loved Brussels and the architecture in the Grand Place is amazing! Interesting facts too, I did not notice that the tower was off centre! You have to look carefully – not so obvious but you can definitely see it if you look at the right angle. I’ve been to Belgium but not to Brussels. It looks like a fantastic place for a wander. The architecture is wonderful – right down to the askew tower. 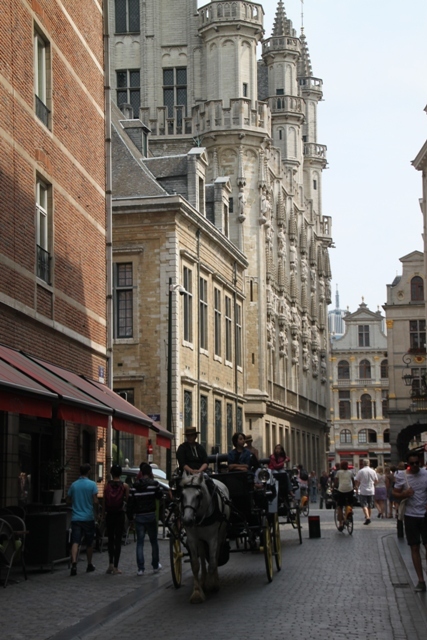 It is a gorgeous city with loads of quirky and interesting little streets all around the Grand Place to explore. We loved it – all of us, not least the vast number of chocolate and waffle shops that were everywhere!! Aaaaaaah! Belgian chocolate. I miss that. Alas I’ve only visited Brussels very briefly Joy – we were en route to Bruges and got the Eurostar before switching to the local train service. Then on the way back through, we caught the ICE train to Cologne from Brussels station. Reading your wonderful post makes me want to see more! I would love all those old buildings and it looks a great place to wander. My daughters have both been there and were not greatly impressed but I think they headed to the bars and skipped on the history and culture! The Grand Palace looks amazing! Hope you have a lovely weekend – winter has arrived here and it’s been pouring with rain for the last couple of days (we had a roof leak which also tripped the lights so have had the electrician here today and the roof plumber is coming tomorrow!). I think we’ll be cooler than the Uk for the next few days! It’s a great city Rosemary – we only had a short stay this time but I love it, so much to see and the square is just gorgeous. Shame your daughters weren’t so keen but I visited when I was a student and the delights of the Grand Place passed me by too somewhat!! I think when you’re younger you have a slightly different agenda! Sounds like you’re having a nightmare with a roof leak – hopefully it gets sorted soon. We are “enjoying” the delights of a UK summer – gorgeous one day, freezing the next!! Loved Brussels and totally agree with you. Night time in the Grand Place is beautiful. And I know what you mean by the carpet of flowers. The postcards we saw of it are amazing. I just wish I’d been more clued up and sorted our trip for a couple of weeks later, the flowers looked spectacular. Still, a good reason to go back next year!! We didn’t even know about it! I reckon there should be a site that lists all the must-see festivals around the world for every day of the year. That would be a great idea! We didn’t know about it either. What a surprise; I never noticed that the tower was off-centre! I visited at Christmastime one year and it was simply magical! You have to look at the right angle, then you can really see the tilt. Christmas must be wonderful there – assume they have Christmas markets. That would be a great idea for a next visit I think!! We have only done Brugge, may have to spend some time in Brussels next time around! Bruges is wonderful, we spent a week there after our stay in Brussels. We did love Brussels every bit as much though – so much to see and do, loads for kids too, definitely recommend it! It’s such a great city – we loved it – loads to see and do, then of course then waffles…and chocolate….and beer – what more could anybody want!! Even better if you have your very own resident guide Melissa! Wow! Your pictures bring back wonderful memories from over 25 years ago. 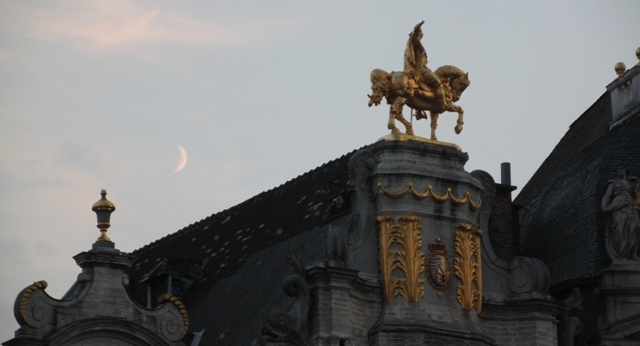 Brussels and Bruges so special in their architecture and mapping of the streets. Every sight dips you further into the rustic antiquity. The Grand Place and waffles, not unlike eating a hotdog in Times Square. Something you just have to do, an overload of your senses, tasting and seeing so much brilliance all around. Thanks ! Thanks Andrew, we just loved Brussels (and Bruges) and found so much of interest to see and do. Food always plays a big part in our trips and those waffles were amazing. We’ve eaten a hotdog in Times Square too – also amazing!! Thanks for commenting and dropping by. Wow, the Grand Place is truly spectacular, I love all the gothic facades and the photos of the cobbled streets. Such a shame you were too early to see the flowers, I image that would have been pretty special. I went to Brussels as a young girl so don’t remember much of it, but after seeing your posts, I think I may have to make a special trip there soon! It’s a wonderful city – an easy journey from the south of England too, we loved our stay and would definitely go back, the Christmas markets sound great but those flowers in the Grand Place would be something I would love to see. Being a Belgian I’m so happy you love Brussels! 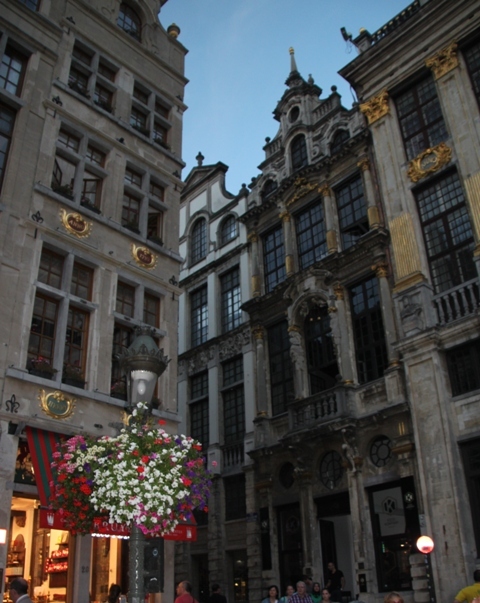 The Grand Place is said to be the most beautiful market square of Europe. And now you’re heading for Ghent! We could have met! I could have shown you all the hidden gems. What a pity! Enjoy your stay in Belgium! Love Brussels, Brugge and just about everywhere else we visited in Belgium – we are really big fans of your wonderful country. The Grand Place is amazing and we loved Ghent too. Meeting up would have been great – we visited last summer – to get the experts view on the hidden gems is something I would always appreciate!! Thank you Joy! And if you plan another trip to Belgium, please let me know. It would be my pleasure to show you around! That is such a kind and lovely offer – thank you!! We would definitely take you up on that – hopefully we’ll be back in Belgium again!! That would be such a lovely time to visit – I can imagine the market in the Grand Place would be just wonderful.